Not long after Chinese New Year, Mamarazzi was coughing her lungs out. Didn't feel like wanna eat anything. Thought of just simple porridge will do la. But evening where to find porridge leh? Think think think...aha...Jeff Kitchen.... Off we went. Hey...not bad wor..Ordered their mixed pork porridge. Quite a lot of meat in the bottom of the claypot. 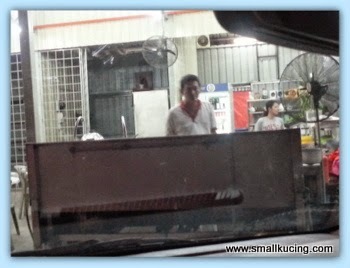 If not mistaken it was RM6 per person. I wanted to have Hokkien Mee but they say that day they don't have Hokkien Mee . Instead Papa ordered this minced pork noodles for me la. Loaded with minced meat lots of lards. Didn't eat much of this. She asked if am still hungry....I said yes.....gave me money and I went down to buy ..
My supper..... Hey...got lots of vege leh. Not bad. Meat wise okay la. 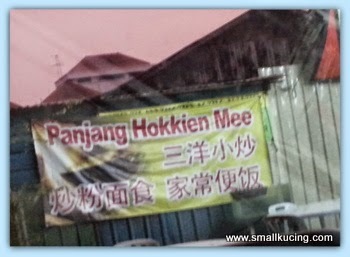 Panjang Hokkien Mee is located opposite road of Jeff Lee Kitchen. The pork noodles look awesome!!! I had Hokkien Mee recently. So sedap! Love the minced pork noodles and the porridge.. I heard they have nice roasted ducks too, izzit? And I heard the paku with red onions and lime is very "hoi wai" also.. Hmm, dunno whether we are talking about the same shop or not.. Been to eat at Sg. Buloh like 2-3-times, and kam ngam, they are famous for this porridge and minced pork noodles.. I like pork porridge. Missed it and I had it last weekend. Small kucing's noddle also look delicious. Haha. 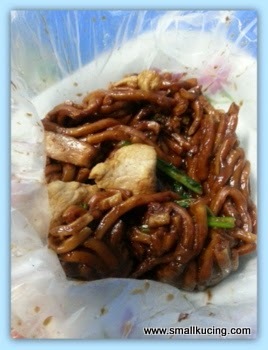 Luckily got Hokkien mee for tapau, can satisfied your craving. I learn so much about different foods when I visit your blog, so thank you for sharing. I have never heard of porridge and noodles together before. Your photos are great, as always, and I hope your mom is feeling better now. That noodles look like the ones I usually see in Sibu Food Mayor's blog one..
kampung baru sg buluh.. i wonder if it is near my new house in Aman Putri Sg Buluh..
That hokkien mee makes me hungry! where to find porridge?? haha, cook at home lah.. but Mamarazzi was coughing until the lungs also almost coughed out, how can request her to cook?? if Paparazzi doesn't want to cook porridge for her beloved pretty wife, then gotta bring Mamarazzi out to eat porridge lor.. but aiyoh, this Mamarazzi ah, coughing still want to eat that fried intestine ke?? so heaty leh..
That looks good. I hope you feel better soon. We had that horrible coughing cold here in December. It took forever to get rid of it. It's fun to get out for a good meal. Porridge is nice. I like with lots of crispy fried meat, eaten with chillies in soy sauce. I think all the dishes you posted look delicious. I'm glad you finally got the meal you wanted. Both porridge and hokkien mee, I like! 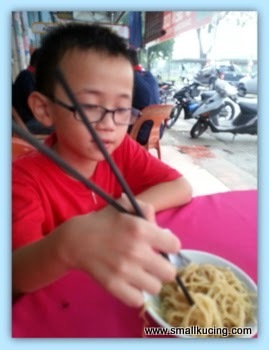 But Ipoh not easy to get good hokkien mee. I miss the KL hokkien mee. I had it in SG but its really not as good as those in KL. haven't try Jeff Kitchen yet.the hokkien mee also. both looks yummy. Wah finish makan already can still want hokkien noodle. This SmallK going to grow up be BigK.